Andrea Shettle has assembled the RatifyNow CRPD Blog Swarm in support US (and others') ratification of the UN's Convention on the Rights of Persons with Disabilities. She's got posters from ratifying countries like India and New Zealand, as well as from countries yet to ratify. I didn't get a chance to make a post for this--the usual excuses apply. But I can make this quick post pointing readers to the blog swarm, anyway. Go, read! How did autism shift from being a rare disorder, occurring in 3 in 10,000 people to an "epidemic," occurring in 1 in 150 people? Is this evidence that scientists are finally counting cases correctly, or is it the result of advances in mental health and education? In this lecture, Roy Richard Grinker, author of Unstrange Minds: Remapping the World of Autism, answers these questions from the perspective of an anthropologist, and as the father of a child with autism. Grinker will discuss the shift in how we view and count autism is part of a set of broader shifts taking place in societies throughout the world. Co-sponsored by NYU's Center for Religion and Media and NYU's Center for Media, Culture and History. All events are free and open to the public. Seating is on a first- come, first-served basis. Meet Mike Dorn and Melania Moscoso of DS,TU at the public lecture in Disability Studies. For more information on this event, contact: Osmin Sullivan - Hewitt, 646-344-7313. Disability Blog Carnival #34 is up NOW! The latest edition is "breaking out" at Andrea's Buzzing About, and Andrea made the graphic at left for the occasion, with bright flowers blooming through a melted place in the snow (oh, my, I've lost my snow vocabulary--I'm sure there's a better way to put that). This edition is rich in thoughtful, diverse posts, and features a handful of bloggers new to the carnival. It pays to read other blog carnivals. I was clicking along, enjoying the unsung stories of teachers and suffragists in the latest Genealogy Blog Carnival, a special edition for Women's History Month, when there she was, Marianne McHugh. Colleen at Orations of OMcHodoy has a nice long reminiscing post about her aunt, Marianne, was was born with Down syndrome in an era when that wasn't a promising start, to say the least. The many photos are such a treasure--baby Marianne with a favorite doll, smiling over the stroller of her new little brother, laughing with her little sister, playing in sand, dressed in her Sunday finest as a teen, in a cowgirl outfit at a Halloween party, posing with relatives (silly faces or solemn, she was great at both). Bella Cohen Spewack (1899?-1990) was a journalist, a publicist, and a writer for stage and screen, best known as the co-writer of the show Kiss Me Kate. But in 1922, while living in Berlin with her new husband, working as a news correspondent, Bella Spewack also wrote a fierce, funny, poignant memoir of her youth, titled Streets. The memoir wasn't published until after her death (it's available from Feminist Press); but because it was written and eventually published, we can remember Bella's little brother Herschey Lang, and have a glimpse of family life in the Lower East Side of the 1910s. Herschey was born to Fanny and Hoosan Lang, both recent Jewish immigrants from Hungary, when Fanny's daughter Bella Cohen was 13. When he was born, his father brought home to the family's tiny apartment a yellow wood cradle; three cents worth of jelly beans were scattered under his mattress, to ensure a sweet life. Needlework pillowcases and tiny knitted caps were brought as gifts, by neighbors. Then, when he was six months old, Herschey got sick: a rash of sores erupted on his face, arms, and hands. The sores left scars. Hoosan Lang shouted at Fanny, "You wretch! You have brought me trouble! You have borne me a sickly child. And a son, God in heaven, a son!" (pp. 77-79) Hoosan left, while Fanny was pregnant with their second child, Daniel Lang. Frequently women, and men too, would stop and unashamedly stare at the two in the carriage. Pregnant women looking at Herschey's disfigured face would stick their thumbs in their belts and immediately look away [a superstitious gesture to prevent ugly children]. One woman, whom I had seen frequently on the block, laughed outloud on seeing Hershey. The black salve that I had applied in the morning was still on his face. "Look at the little rat." For a moment, I felt as if the roaring in my ears and the pounding within me would never stop. Then I walked over to the woman and struck out. My outstretched hand landed on her neck. When the pier got a little too pungent in the summer heat, Bella took the little ones to a playground, where they could play in sand and take turns on the swings. She also included the boys in her dramatic productions with neighborhood teens: they played a stringed instrument during a scene from Romeo and Juliet, enacted on a tenement fire escape. Fanny and Bella got summer jobs working at a resort in the Catskills, and the boys came along, so they could eat better and get some fresh air. "I was fierce with desire that children play with Herschey," Bella recalled about that time, "for they shunned him and he loved them dearly." (p. 125) Soon, the management noticed how sickly Herschey was, and sent the whole group back to the city. Herschey Lang died at age 5, after a long illness that included fevers and paralysis and a lot of lost weight at the end. "My mother was mad with the pain of her loss," explains Bella (p. 157). "So it fell to me to arrange for the burial." The last sentences of the memoir present a painful scene: "My mother and I, carrying Danny in my arms, attempted to follow the hearse on foot for we could afford no carriage. But the hearse moved swiftly. Herschey was light." Herschey Lang didn't live long, but he was loved, dearly loved, by his mother and sister, right to the end. And he was never forgotten. Lisa Muir, "Rose Cohen and Bella Spewack: The Ethnic Child Speaks to You Who Never Were There," College Literature (Winter 2002), online here. We have been hearing about the great things about the disability arts initiatives in Chicagoland. In this WLS Chicago, ABC 7 News video, curator and award-winning artist Riva Lehrer leads us on a tour of the new Disability Arts and Culture Center that recently opened at the new eco-friendly home of Access Living, at 115 West Chicago Avenue. Curators Sharon Snyder and David Mitchell are to be applauded for their Disability History installation, also featured in the video, which has served as a key vehicle for documenting and celebrating the many creative acts of resistance by and on behalf of people with disabilities. See the DS.TU post from April 25, 2006 on the Not Dead Yet 10th Anniversary Celebration. Access Living is one Center for Independent Living that has truly embraced the arts as a mode of expression and reflection on the changing place of disabled people in today's society. If you are in Chicago, I certainly invite you to check out these installations. Families in the US navigating their resource options figure out pretty quickly that some states are better than others for kids and adults with developmental disabilities. And one of the worst states, by any possible measure, is Florida, where over 15,000 people are on a waitlist--more than 2,500 of them have been waiting for more than five years--for such essential community services as respite hours, training programs, and employment supports. Some other states have waiting lists, but Florida's is especially glacial, and shows no signs of improvement. Now EndtheLine.org has a website, with family stories, sample letters to the editor and letters to elected officials, and news items to help advocates work for change on this appalling situation. Even if you don't live in Florida and never expect to, it's a site worth visiting as an example of online advocacy. And it's worth knowing what's happening there, anyway--because stuff like this thrives when no one beyond state borders notices or cares. Well, we've noticed, Florida. A lot of folks have noticed. "You are an important person just the way you are." This Thursday would have been Fred Rogers's 80th birthday. 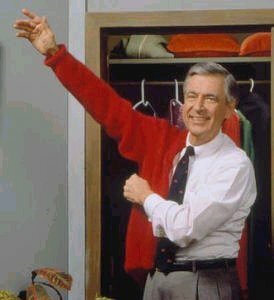 In observance of the date, the City of Pittsburgh (Rogers's homebase) is inviting folks everywhere to wear their favorite sweater -- if you have one, a zippered cardigan would be most appropriate -- and send in a photo or video. Here's a video explaining "Won't You Be My Neighbor?" Day. Fred McFeely Rogers wasn't disabled, but for many American children, his show was an early introduction to people with disabilities, adults and children, as "neighbors"--ordinary, interesting, full members of the community. Longtime cast members on Mister Rogers' Neighborhood included Chef Brockett (played by the late Don Brockett), owner of Brockett's Bakery, who sometimes talked about his physical disability (he had a visible limp); and Mayor Maggie (played by Maggie Stewart), who was a professional ASL interpreter as well as a town executive. Violinist Itzhak Perlman was a guest on Rogers's show, and later played at Rogers's funeral, expressing his admiration for the man. "If you feel like trying to help somebody, it's a good idea to ask first. Sometimes people want help, and sometimes they don't." I'll be wearing my cardigan tomorrow. "Somewhat formidable in later life, Ethel became quite deaf and brandished an immense, silver ear-trumpet, adorned with chiffon to match her dresses." Happy 42nd birthday to twin brothers Marco and Raul Midon. They were born in New Mexico, to parents of Argentine and African-American ancestries. Their blindness was caused by the way incubators were used for premature babies in the 1960s. Marco Midon is an engineer at NASA's Goddard Flight Center, who uses JAWS (a computer program that makes many software applications accessible for blind users) and other assistive technologies in his work. "If I want to be the best, and compete on the same level as those in the sighted world, I need to have the best equipment. It enables me to maximize communications with others, and get things done. I consider my communications and other technology to be a part of me, and I take it wherever I go," says Midon. Picture yourself in world where there's no one else. Nothing more to say and no one left to say it to anyway. Please listen to what i say. Everybody is free to make a difference. Picture a world where the people all feel their worth. There is a reason for everyone's time on earth. Wondering why you should care. And only love can see us through anyway. You don't have to be a big celebrity. I just joined temple 15 days ago. Icome from the Basque Country, Spain. and i'm interested in doing disability research. Disability Blog Carnival #33 is up NOW! Ruth at Wheelie Catholic has assembled this latest edition, around the theme "Appreciating Allies." All the usual subjects, you know, snowmen with service dogs, Springsteen concerts, theater seating... go check it out. (What, your snowmen don't have service dogs? Well, get busy! We build snowmen from sand here in Southern California, so weather is no excuse.) Thanks Ruth! With today's resignation of Eliot Spitzer from the office of governor of New York, David Paterson becomes acting governor--the third African-American state governor since Reconstruction (after Deval Patrick and Douglas Wilder), AND the first *or second, see "stop the presses" below* blind state governor in US history. I've made a list of some other political leaders who experience blindness, as a reference. Folks who do disability studies may be asked questions about this in the next few days--I figure it's good to have some handy details to share. On the international scene, there's the UK's Gordon Brown--the current Prime Minister is partially blind from a rugby injury in his youth. Thomas D. Schall (1878-1935), blind from a 1907 electrical accident, served five consecutive terms in the House of representatives (1915-1925) and then was elected to two terms in the Senate (1925-1935). This year, another may be added to the list, as Rabbi Dennis Shulman is running for office in New Jersey--he would also be the first rabbi elected to Congress. Willie Brown, the recent mayor of San Francisco (1996-2004), has significant vision impairment from retinitis pigmentosa. Brown was also a state assemblyman for seventeen terms, and the longest-running Speaker of the California Assembly (1980-1995). Elsewhere in the US, Randy Meyer, mayor of Sheboygan Falls WI, has been blind since surviving cancer in early childhood. Some other blind mayors on the recent international scene: Apolinar Salcedo, mayor of Cali, Colombia; Richard Lees, mayor of Taunton, Somerset, England. *UPDATE: Yes, I sure did leave out some important names! In comments, Day in Washington quickly added Thomas P. Gore (1870-1949), who served in the Senate (1907-1921). (No close relation to Al Gore or his family, but TP Gore was the grandfather of Gore Vidal. Also, interestingly, Thomas P. Gore's given name at birth was Governor Thomas Pryor Gore--but he wasn't ever an actual governor.) Thanks Day! Keep them coming. **SECOND UPDATE: H-Disability network members came up with a couple more: Joan Tucker suggested Senator Floyd Morris, who is the current Minister of State in Jamaica's Ministry of Labour and Social Security; and Roger Daniels suggested MP David Blunkett, a member of Tony Blair's cabinet. Thanks! ***THIRD UPDATE: Another couple from the H-Disability discussion thread: Harilyn Rousso asked if there were any blind women in elected office; so I searched a little further and found Anita Blair (b. 1916), who was elected to the Texas state legislature for one term (1953-55). She was blind from a car accident at age 20, and was the first person in El Paso to receive a guide dog (she even made a film about that, called "A Day with Fawn"). Blair's got a listing in Nancy Baker Jones and Ruthe Winegarten's Capitol Women: Texas Female Legislators, 1923-1999 (University of Texas Press 2000): 130-131. And there's a 1952 Time magazine article about her winning the Democratic nomination that year. But she sounds worth a research paper, at minimum, somebody? Cathy Kudlick also pointed to Henry Fawcett (1833-1884), a member of Parliament in the 1860s and 1870s, Postmaster General too (1880-1882), and husband of suffragist leader Millicent Fawcett. ****BUT WAIT, THERE'S MORE! (3/13): The website Political Graveyard has a very comprehensive listing for "politicians with physical disabilities" (which, in their categories, includes blindness). More blind legislators there: Ellis Barkett Bodron (1923-1997), who spent more than thirty years in the Mississippi State legislature; Pennsylvania's Matthew Anthony Dunn (1886-1942) was in the House of Representatives, 1933-41; Nehemiah Hezekiah Earll (1787-1872--can't beat that name) served one term in Congress, 1839-41, representing New York; Robert D. Mahoney (b. 1921) served almost twenty years in the Michigan state house of representatives; T. Euclid Rains Sr. (c1921-2000) was in the Alabama state house of representatives (1979-91), but was also known as an avid beekeeper and Little League coach; and Mo Udall (1922-1998) was a professional basketball player and US Representative from Arizona (1961-91)--he had a glass eye from age 6. *****STILL MORE! (3/14): Hernando de Soto Money (1839-1912) was a longtime US Representative from Mississippi (1875-85, 1893-97), and was appointed to the Senate in 1897 to fill a vacancy (he was elected in his own right in 1899, re-elected in 1905, and was at one point minority leader). His obituary in the New York Times noted that "He was long troubled with an affection of the eyes, which made him almost blind." And while I'm here, Stephen Kuusisto wrote a fine, fine op-ed piece on Paterson for the New York Times today. ******STOP THE PRESSES! (3/15): Bob C. Riley of Arkansas (1924-1994) was acting governor of his state for eleven days in 1975, and was blind from a 1944 WWII injury. Eleven days -- covering the gap between Dale Bumpers becoming a Senator and David Pryor's swearing-in -- isn't exactly a governorship, but if this technicality is relevant to your needs, call Paterson the second blind governor in US history--but the first to have a substantial term to serve. On Tuesday, Lt. Gov. David A. Paterson waited. Around noon, he was driven from his home outside Albany to the Capitol, raising expectations that Gov. Eliot Spitzer would soon resign and that Mr. Paterson was about to become the state’s 55th governor — and the first African-American to hold the post. Neither happened. Mr. Paterson returned home and waited some more. With Mr. Spitzer’s political future in grave doubt, Mr. Paterson, 53, a Brooklyn-born and Harlem-bred politician, has become Albany’s man of the moment. Widely considered smart, amiable and disarmingly candid, he is also largely untested. In 2006, Mr. Paterson surprised the Democratic establishment by giving up the possibility of becoming majority leader if the Democrats captured the State Senate — one of Albany’s muscular three men in the room — to run for lieutenant governor, a largely ceremonial post. But this week, Mr. Paterson’s political gamble suddenly appeared to be on the brink of paying off, if in an unexpected and unintended way. If Mr. Spitzer resigns, Mr. Paterson would become only the third black governor of any state since Reconstruction. From the time he refused to learn Braille as a child, Mr. Paterson, who is legally blind, has been defying expectations. Former Gov. Mario M. Cuomo recalled playing basketball against him in a charity game a decade ago. Fellow Democrats and Republicans consider him to be more liberal than Mr. Spitzer and also a more deft politician, capable of healing the rancor that has driven Albany into gridlock. 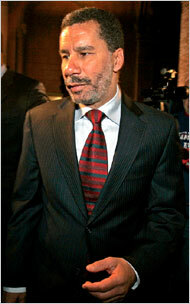 David A. Paterson was elected New York’s lieutenant governor on November 7, 2006. Ask most baseball fans today to name a one-handed player in the Major Leagues, and they're likely to say Jim Abbott--and that's a good answer. But ask someone older, from northeastern Pennsylvania, and you're as likely to hear the answer "Pete Gray." 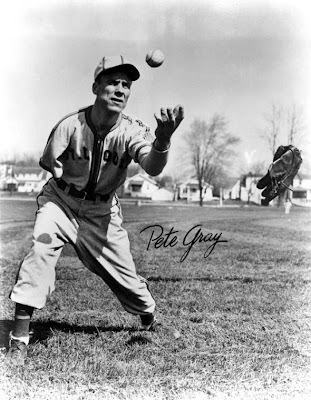 Pete Gray was born Peter Wyshner in Nanticoke PA, this date in 1915, the son of immigrants from Lithuania; his right arm was amputated at age 6, after a wagon accident. Wyshner lived in coal-mining country, so there were plenty of others with accidental injuries and lost limbs in his community--and it wasn't considered too unusual that he'd still want to play baseball. When he wasn't working as a water boy at the Truesdale Colliery, of course. He played in the minor leagues during the WWII, when so many of the usual players were in uniform; then in 1945, he was picked up by the St. Louis Browns, and played 77 games in the majors as an outfielder. He was famous for the speed with which he could catch a ball in his glove, toss the ball in the air, remove the glove, grasp the ball, and throw it (that's the maneuver depicted in the publicity still above). As Pete Gray, he was featured in newsreels, a novelty story intended to inspire returning troops and attract audiences to the games. He stayed in baseball's minor leagues into the early 1950s, then retired to Nanticoke. His later years were hard; he died in a nursing home in 2002, after years of alcoholism and very little income. Pete Gray's glove is in the Hall of Fame at Cooperstown. William C. Kashatus, One-Armed Wonder: Pete Gray, Wartime Baseball, and the American Dream (McFarland & Co. 1995). William C. Kashatus, "Baseball's One-Armed Wonder: An Interview with the Late Great, Pete Gray," Pennsylvania Heritage (Spring 2003): 30-37. 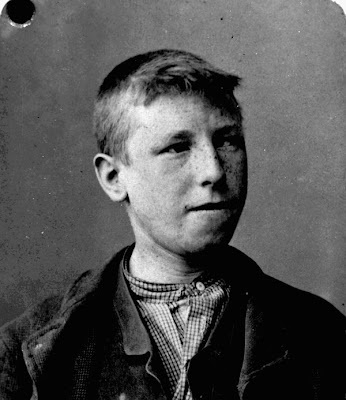 Back last May, for Blogging Against Disablism Day, I wrote up a post about George Everitt Green (1880-1895), an English child who was apparently killed by his foster mother in Canada after he didn't match her expectations for what a teenaged boy should be able to do--he was described as small for his age, "backward," and as having "defective vision." The foster mother was never convicted, and the case was used to spur feeling against immigrants, especially young disabled immigrants, as the "diseased offscourings of the hotbeds of hellish slumdom." In that post, I wondered if there was a photo of Green anywhere--the Barnardo emigration program that brought him to Canada was famous for photographing each boy before he set sail. Well, thanks to a new comment on that post from sarahquay, I now know there is a photograph of Green, in the Library and Archives Canada, and it's online. "Death through ill-usage" is the wording of the crime in his file (where the name is spelled "George Everett Greene," thus the spelling in my title above). 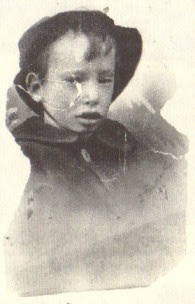 Above is George Green, age 14, about to board a boat to North America. Hopeful, maybe; confused, maybe; wary, probably; young, definitely. Not much older than my own son. Within the year, he would be dead from abuse, malnutrition, exposure, exhaustion, and gangrene. He's looking out across more than a century, and I wish we could look back and say "things have changed." But they haven't, or not nearly enough.